"This delicious hot salad is easily made into a main course by adding crumbled, cooked Italian sausage." Drizzle olive oil on a rimmed baking sheet. Spread spinach leaves in a thick layer covering the baking sheet. 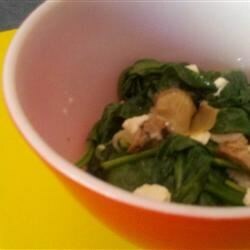 Arrange onions and artichokes over the spinach, and drizzle the marinade from the jar over the entire salad. Sprinkle with the cheese (and sausage, if you wish). Bake for about 10 minutes, or until the spinach is wilted but NOT crispy. Watch how to make spinach salad with tangy, hot-bacon dressing. This sounded like it would be better than it turned out. Just didn't appeal to me. Sorry. Great salad. I only used half of a red onion and it was plenty. Will make again.